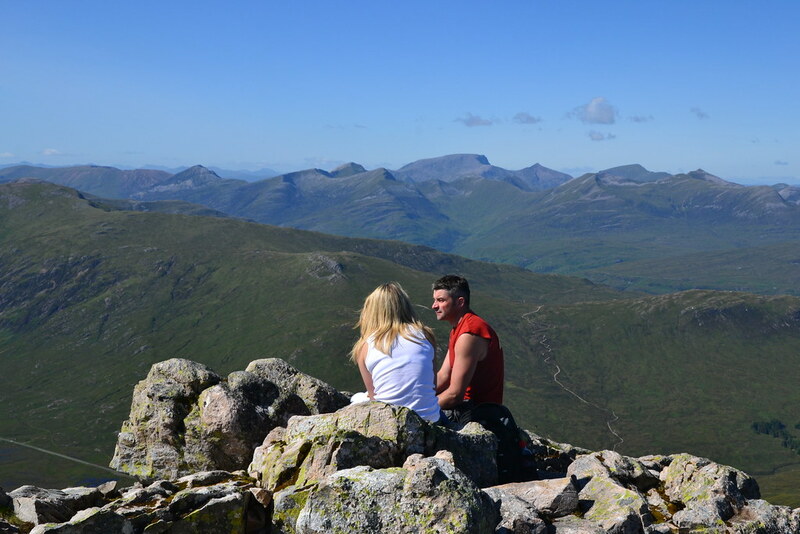 Sunday 24th July 2011 was one of those days, you just knew that you could have picked any mountain in West of Scotland and the weather would be superb. 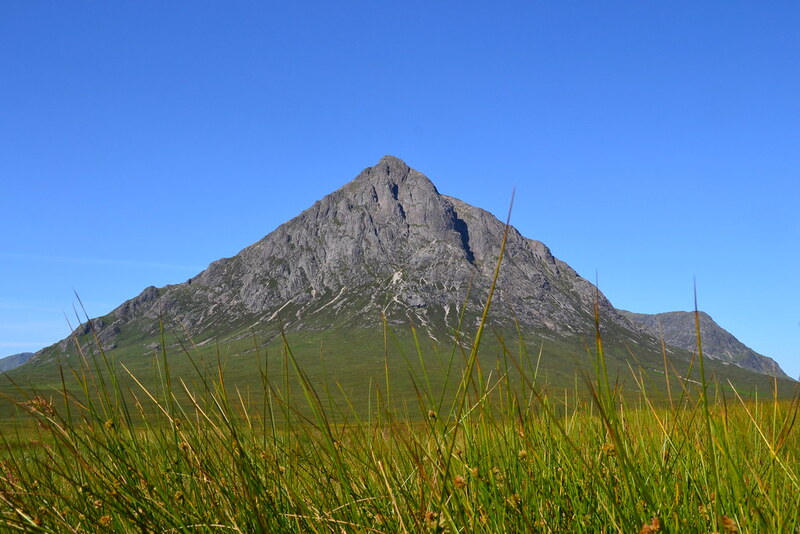 As I was looking for something that bit special for my 50th munro, the lure of Buachaille Etive Mor in Glencoe was too much for me to resist. Did I mention the weather was ideal? 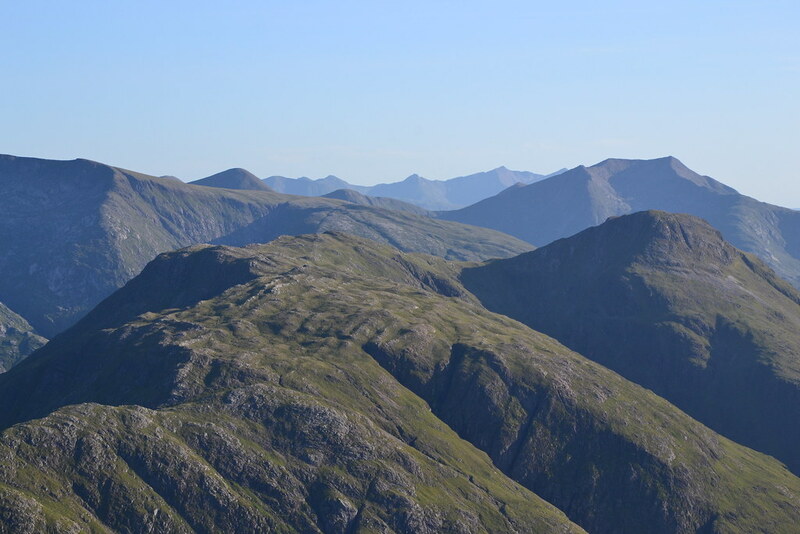 I'd read so much about the Curved Ridge route, not least the Walk Highland's "Idiot's Guide to the curved ridge", and having watched the HeadCammer Production's DVD which clearly shows the route knew which was I'd be going at the fork in the path! 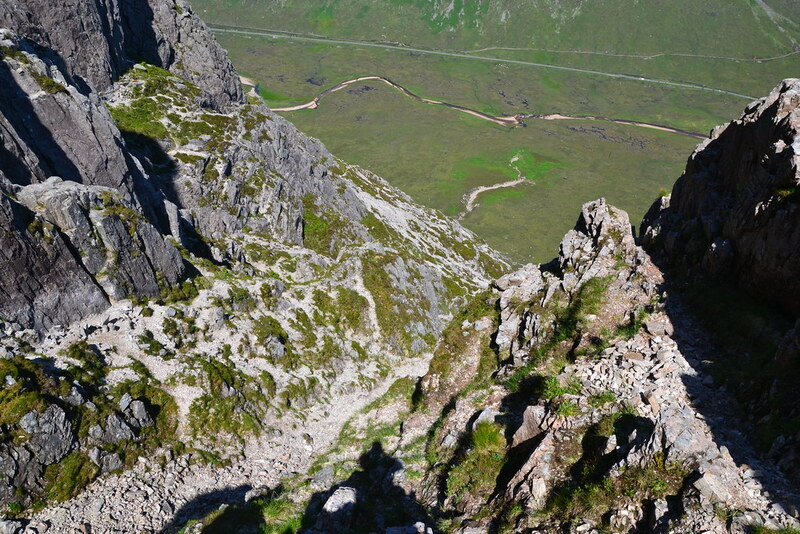 A look back down the scree slope - fair old height up and not even on the ridge yet! 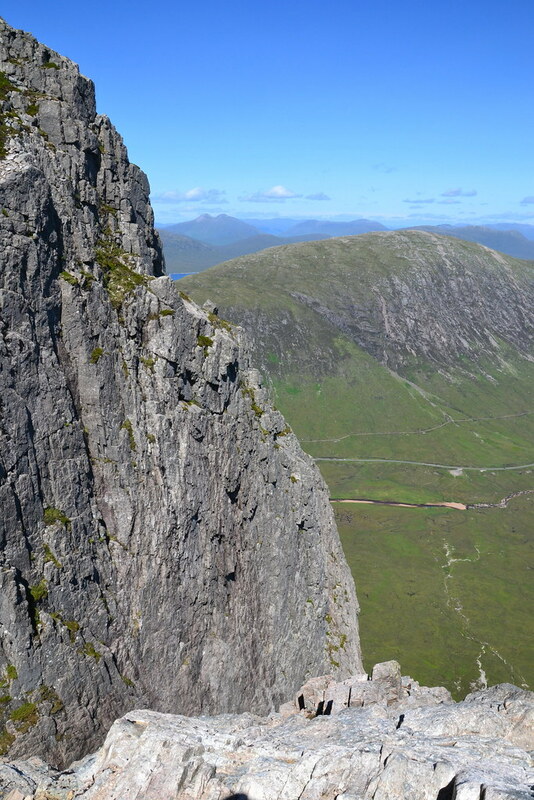 I was doing this climb on my own but just after the scrambly bit behind the water slab, met two rock Jocks - Michael and Mhorag from Arran who offered to accompany me to the Rannoch Wall. This offer was most welcome, and we headed up the curved ridge Michael leading, me in the middle and Mhorag bringing up the rear. Michael put my mind at ease by offering the assitance of roping up if the exposure got too much. It was great to follow someone who'd done the route many times. 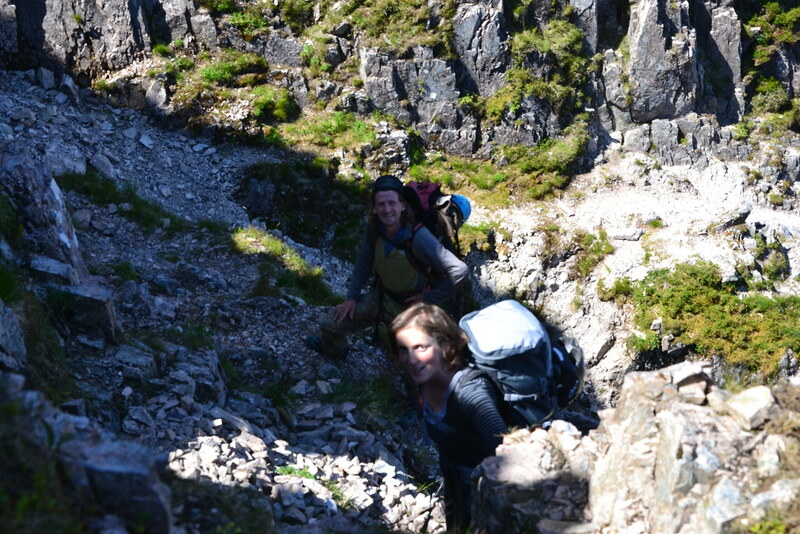 The actual scrambling was really great fun. The rock is amazing and I hardly ever had any difficulty locating suitable handholds and footholds. 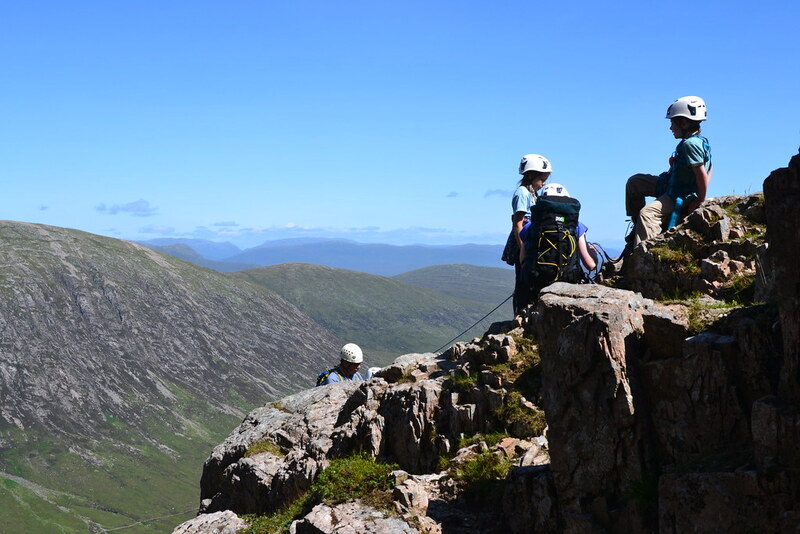 I really liked the fact that there were many natural breaks in the curved ridge where our party of 3 could take off our back packs and have a drink, take a photograph or some video, or in Michael's case roll a cigarette and borrow my handy £1 shop lighter. 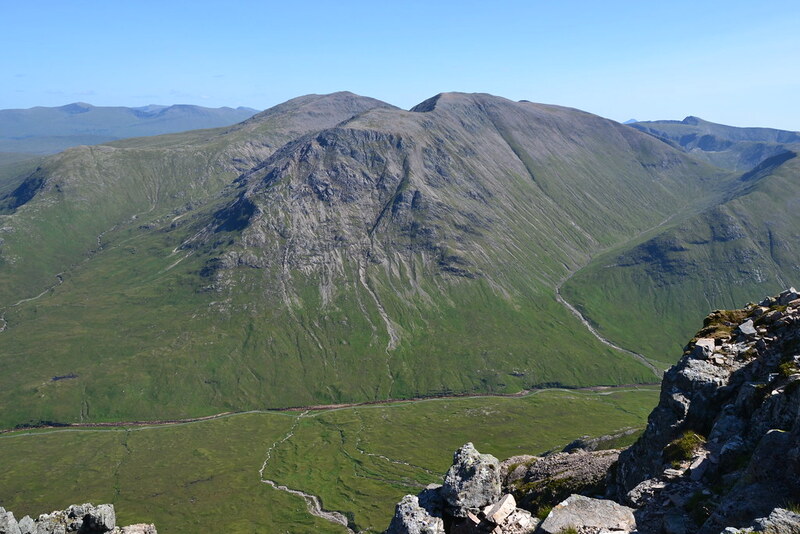 There was a young family in front of us all roped up - middle aged mum,3 young kids and dad bringing up the rear, who we managed to pass just before the Rannoch Wall, so the ridge seems plenty wide. Spurred on by the confidence that Michael and Mhorag (thanks guys if you read this) had given me, I was off on my own up the steeper section of the curved ridge, I found myself using my knees now too to get up the sections. In fact, as I type this walk report 2 days later, I have numerous grazes on my skins and a few bruises and small cuts onthe inside of my upper arms. I never felt these at the time, I guess the adrenelyn at the time took care of that! 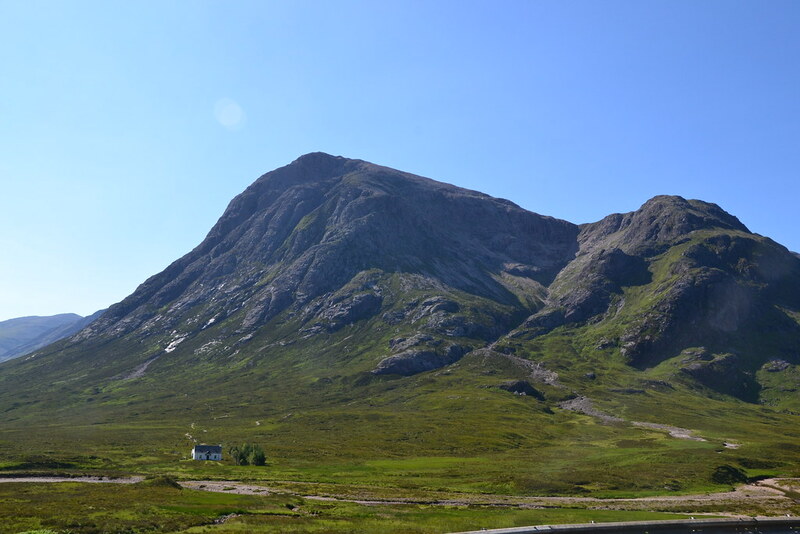 I was amazed at how quickly you ascend, as I left the base of Rannoch Wall far behind, in no time at all, I was level with the topmost rock Jock on the wall. Another group of 3 guys passed me at this point and I followed them until I hit a point where I didn't know where to go. 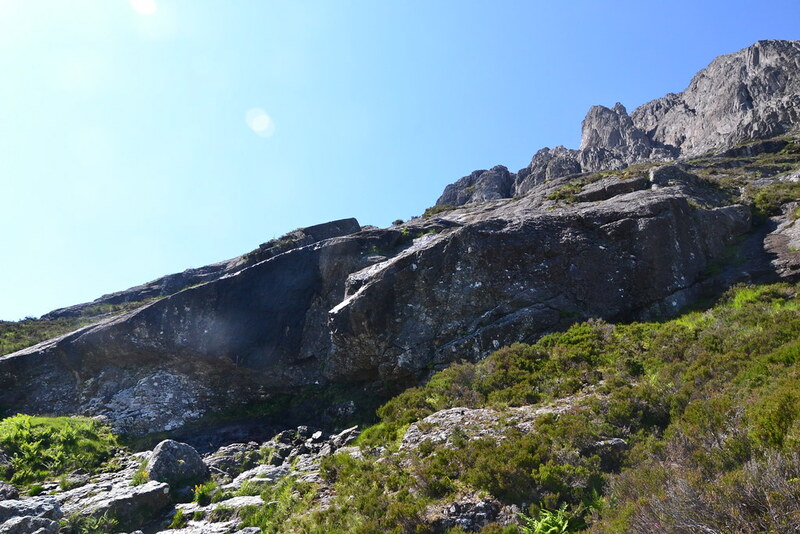 The rock in front was too hight for me to pull myself up, there were no good footholds or handholds - I almost started to panic! However, I kept calm, as I knew there was no way that I could actually afford to panic! I knew that the roped up family were coming up from behind me, which gave me a lot of comfort too. Very quickly, I realized the correct route was a shimmy to the right hand side of a few feet, from where there were the great hand and foot holds, and I was scrambling up again. 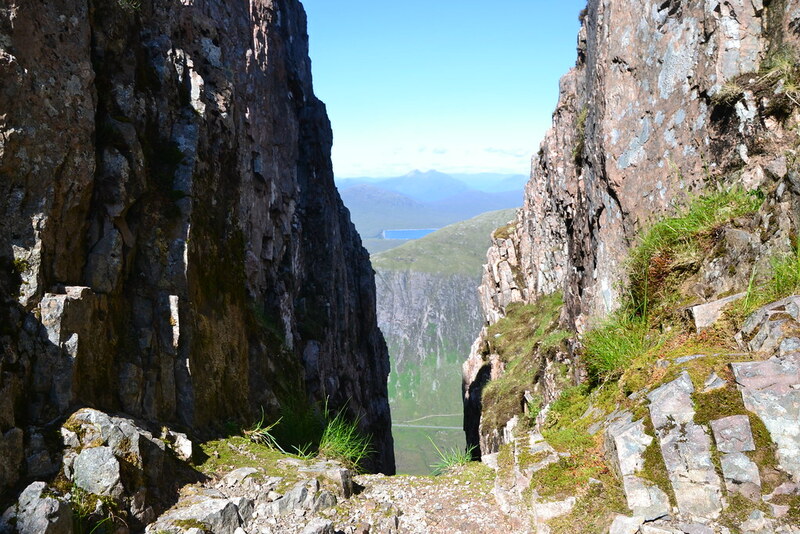 In no time at all, the route started to level off, so was more walking than scrambling and there was a largish plateau, from where I could afford to take the backpack off, get the camera and camcorder out and take in the sights! 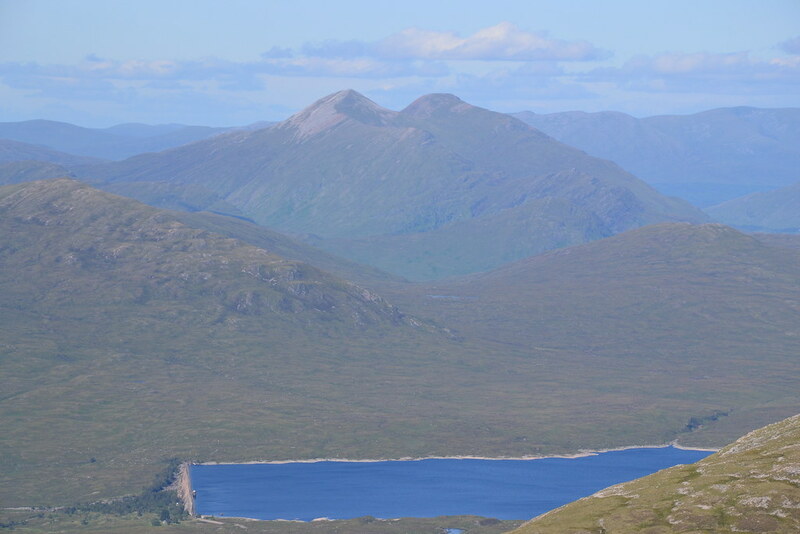 You have unobstructed views over Rannoch Moor, and due to the great visibility, I could clearly make out the "pointy fellow" that is Schiehallion. 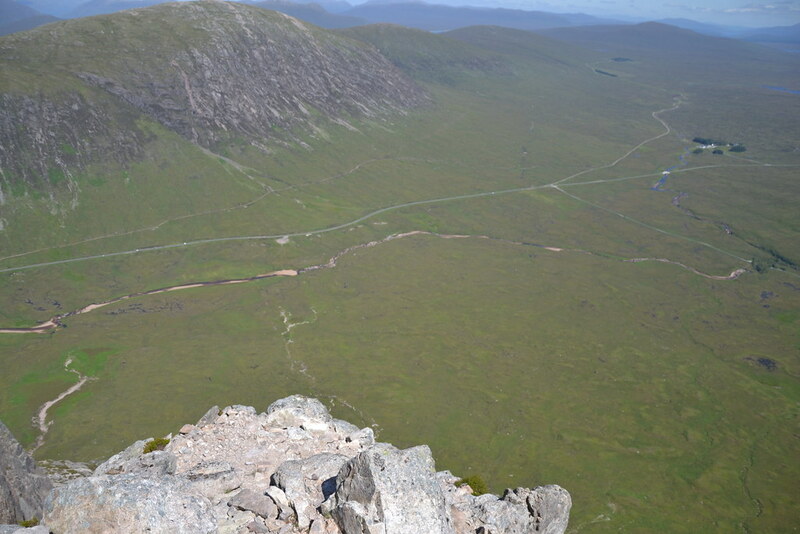 I watched and listened to the Rock Jocks having fun climbing up the Rannoch Wall, after all, they were now below me! I could them hear the roped up family approach, so started to think about where the route went from here. 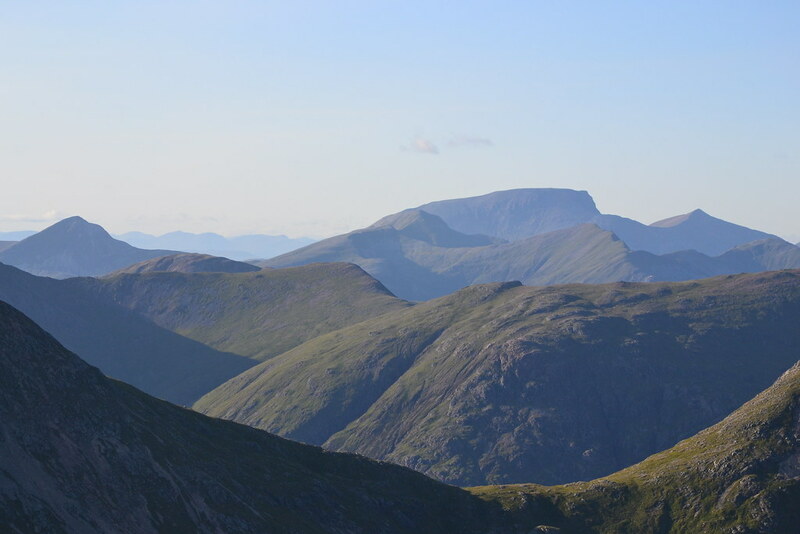 Due to the wonders of modern technology and the fact that I had 3G reception all the way up the curved ridge, I double checked the Idiots Guide on the Walkhighlands website from this plateau and realised that I was indeed at the end of the curved ridge. The groups of guys who I'd tried to keep up with, I'd seen them take an obvious path that went round the front of the Crowberry Tower, upwards in the direction of to the right. This seemed to tie in with the Idiot's Guide which suggested that insteas of following the scee to the left side, you head right towards the Crowberry Tower. 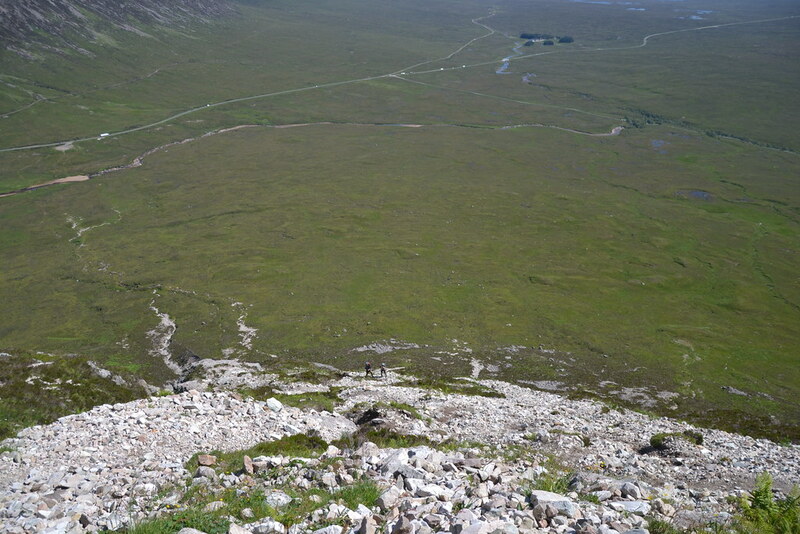 By this time the roped up family had caught up with me and after some discussion they decided to head up the scree and I took the path to the right up the front of Crowberry Tower. 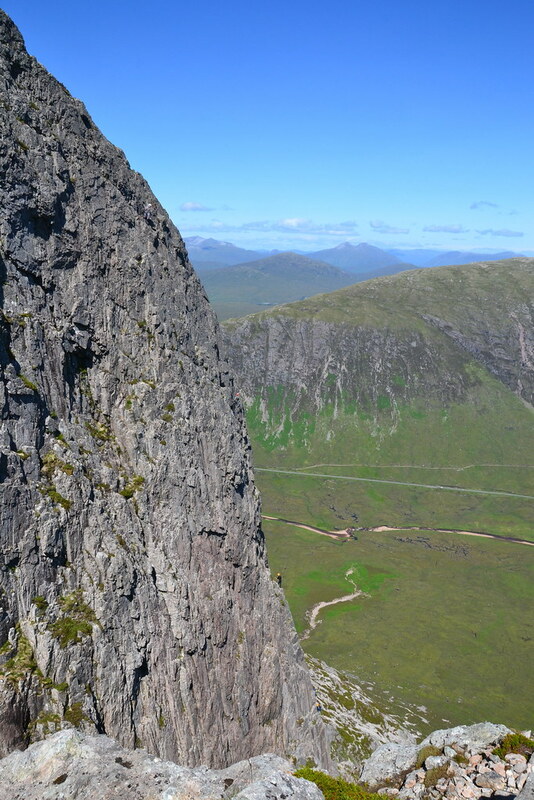 Not long into this, I met the Rock Jocks walking over from their completed ascent of The Rannoch Wall. One politely enquired as to "where was I going"? When I said the summit, he ushered me back to the scree part instead. A big thankyou guys!! I then waited on the family clearing the scree, as there was a lot of debris being disloged and then followed them up. Now it became clear what the Idiots Guide meant! 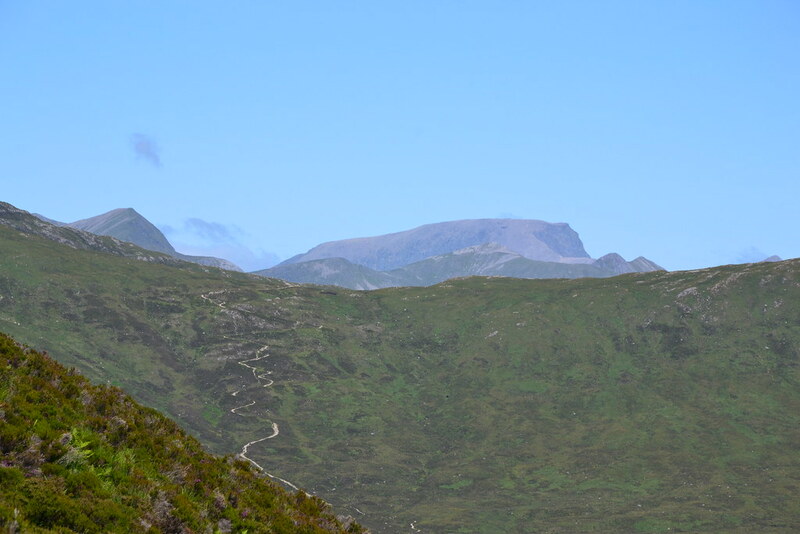 You have the choice of following the scree all the way to the left and then hitting the path to the summit, or there is the obvious shelter from the exposure seen to the right hand side here, but going up the passage at the BACK or the Crowberry Tower! So in no time at all, the familty were taking a rest at the gap, from where I took a Family photograph for them. Whence they headed up left towards the summit I could get my camera and camcorder out again and take some footage of the Crowberry gap and then the Crowberry Tower from above. 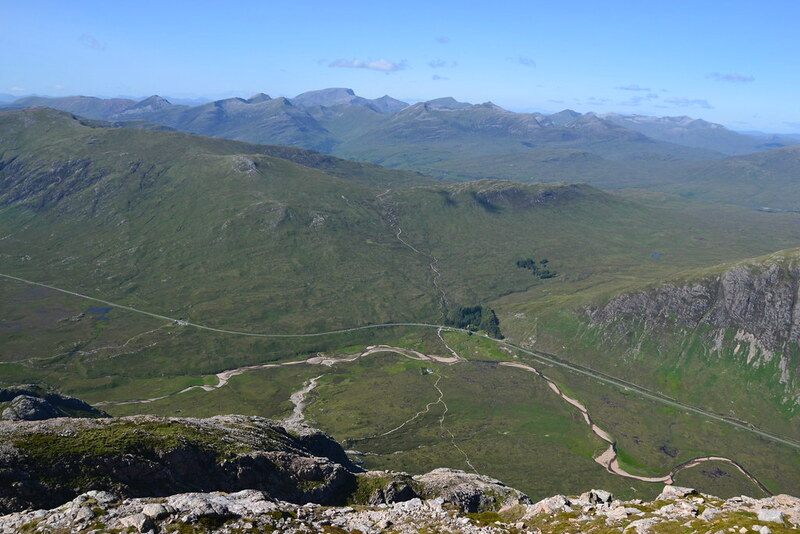 It isn't far from here until the summit is reached, and what a buzz it gives when you get there! A drink and a bite to eat and then its off on the long slog down over to the second munro at the far end of the ridge. 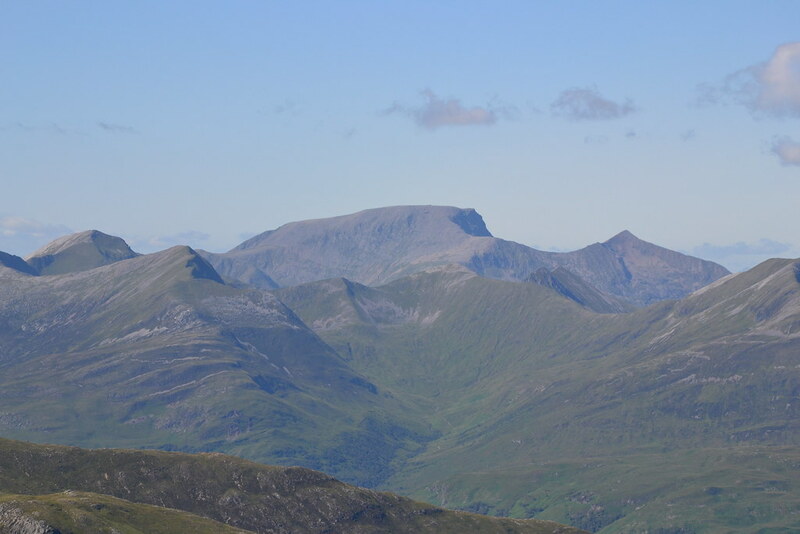 Annoyingly, to reach this munro there is a larger munro top of Stob Dearg to climb and descend. 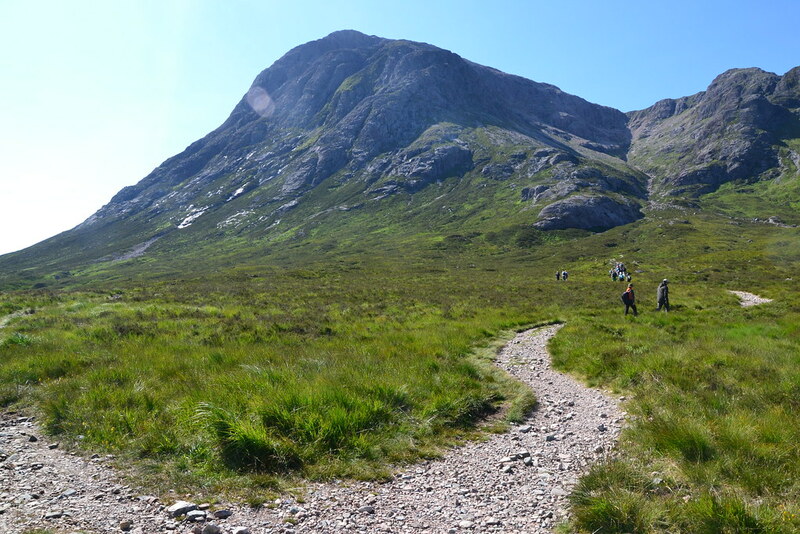 At least on the way back, this is bypassed as you drop down the well formed path into the Lairig Gartain and the easly walk back to the A82 layby. Knowing I had a long summers day, I'd been taking my time and soaking up the amazing 360 degree views, and I arrived back at the car just before 10pm after 11 hours on the go. 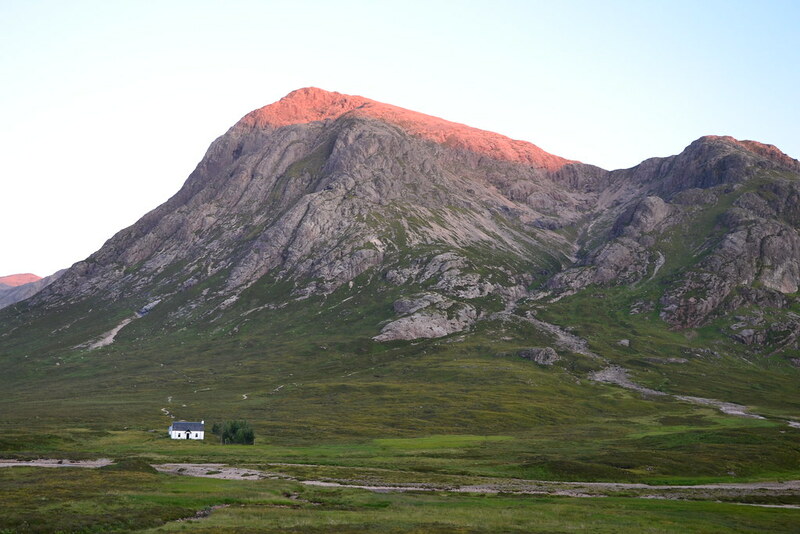 Stob Dearg was looking magnificent with his upper half bathed in that lovely orangely light that you get at the end of the day. 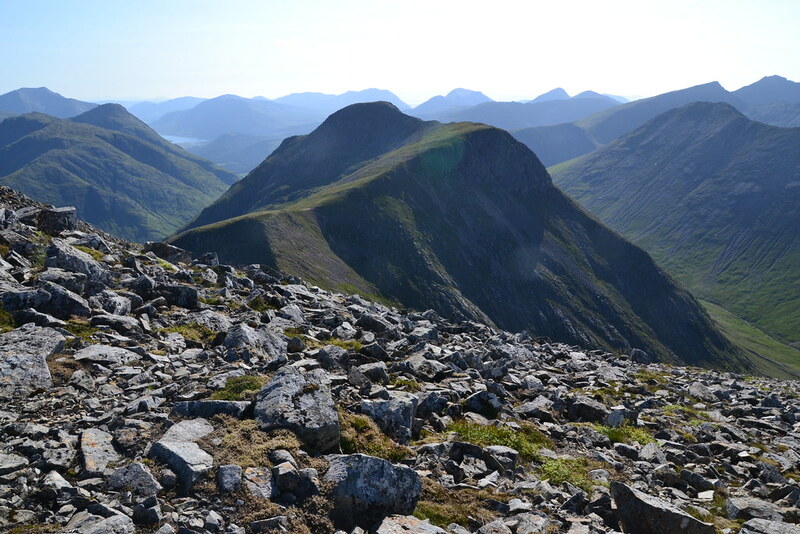 Munros 50 and 51 bagged and Stob Dearg bagged via the famous curved ridge route, I was well chuffed with myself. Part 1 off 3 - The curved Ridge! Last edited by jwramsay on Fri Aug 19, 2011 11:12 am, edited 7 times in total. What a fantastic report and a great way and day to bring up you half century . This will be added to my own "idiots guide" to Curved Ridge file . 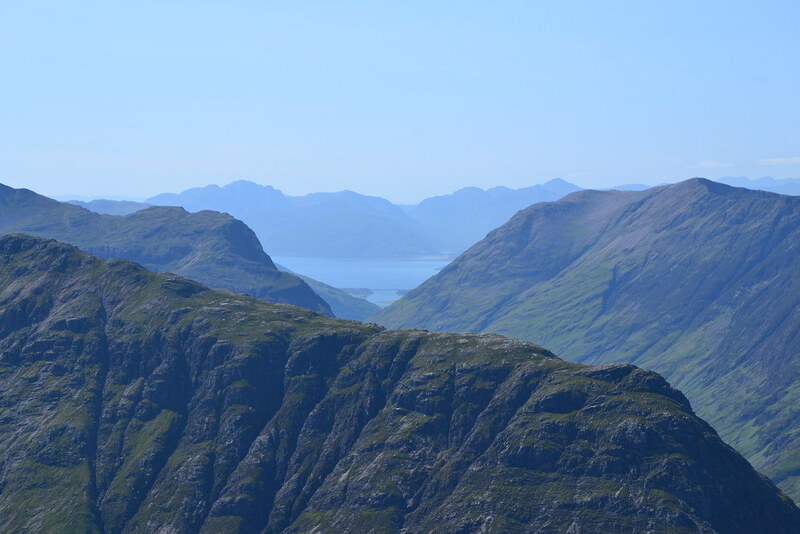 Great reading your report - amazingly clear pics - you could wait years for weather like that. Great report. Will need to pluck up the courage to do this now!! Guys, I hate exposure, I shy away from it. I decided to check out the Curved Ridge. When you get 1/2 way up and your companions (Mhorag & Michael) say it's just more of the same, your confidence grows and after all it's easier to go up than down! If I can do it, anyone can do it! And think of those 3 roped up bairns!! 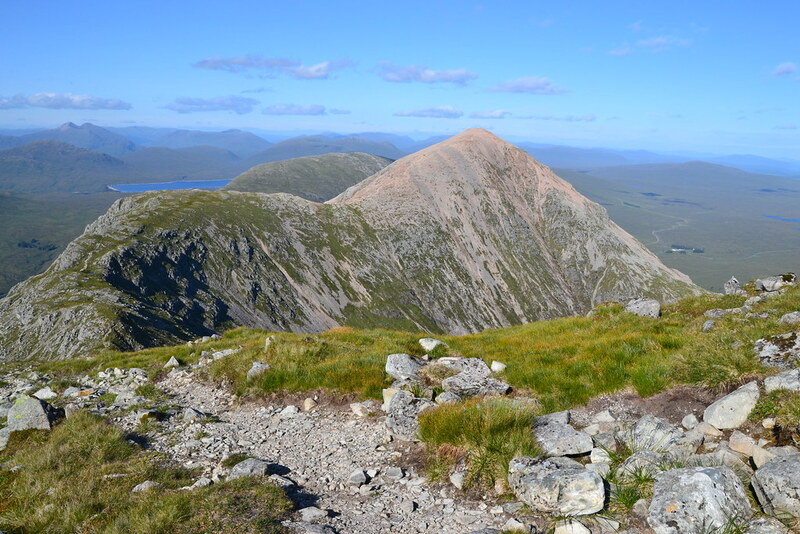 Added the remaining videos now which show the ridge walk to the 2nd munro and have all of my photos included. Thanks for the "Great Walk" votes guys. I know, I was too scared to look but could afford to let the camcorder at arms length have a peak! last thing I wanted to do up there was freeze. Great report. 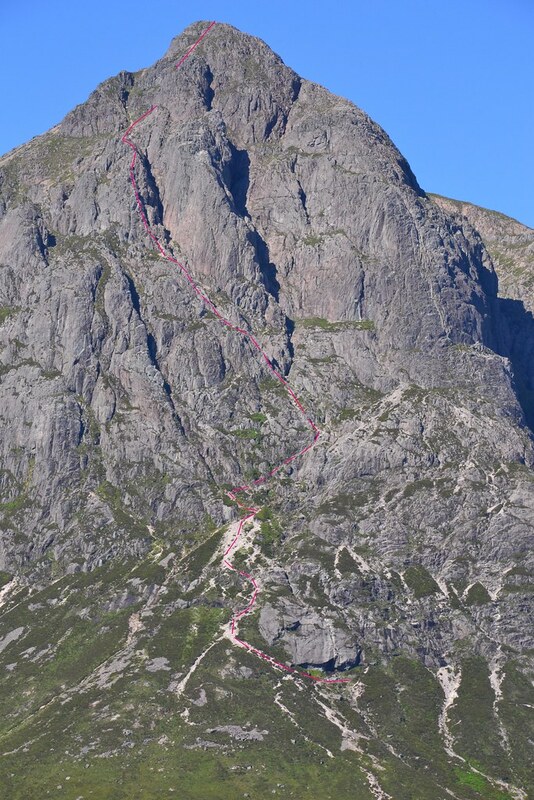 Nice to see the route of Curved Ridge drawn on the photo . 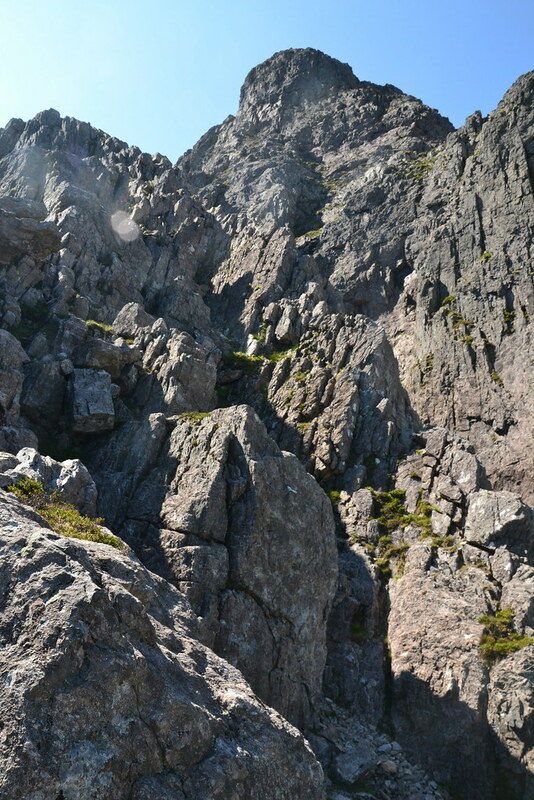 I have only done the start of Curved Ridge en-route to do Agag's Groove on Rannoch Wall. I need to go back to do the whole of it sometime. 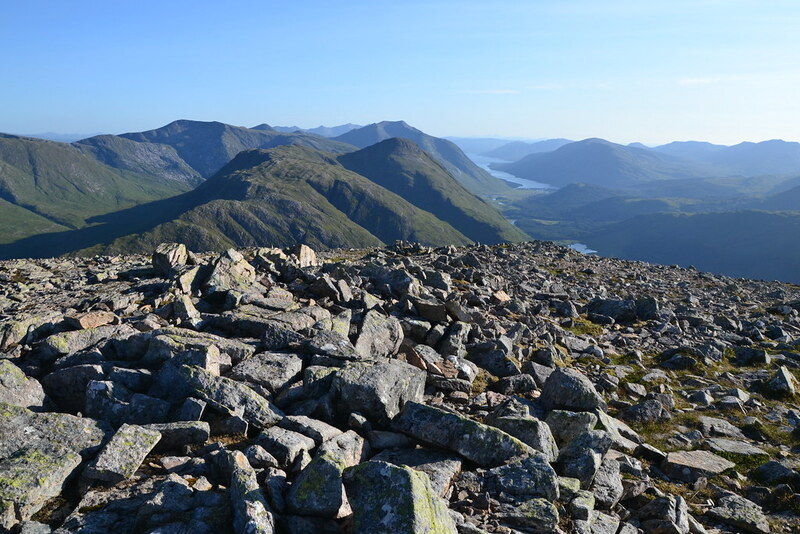 This is what I've been waiting for ever since my first time up Curved Ridge - great pics and the route shown on the mountain, so that I can show off to my husband! I may never be up there again (time's winged chariot and all that) but this is a great reminder of a day before digital cameras were the norm. Thank you!